Words have power. They have energy. They create a state of being in our minds. Horses don’t use words, but we understand the energy behind what you say. You’ve probably heard the saying, “Sticks and stones may break my bones, but words will never hurt me.” I say, the wounds from a stick or stone will probably heal, but the damage caused by the negative words we hear may sting for life. Never underestimate how your words affect those around you, as well as how they reflect back and affect YOU. If your self-talk is negative, your experience is going to be negative. If you speak positively, your experience will reflect the same. If you bark and growl at your horse without careful thought to the attitude you’re projecting, your horse is going to feel insecure and you’re going to maintain a negative vibration. If you’re snapping at the people around you, the energy you’re projecting can be just as damaging as a pointed stick jabbing into someone’s heart. Have you ever asked yourself, is it better to be right, or is it better to be kind? It’s a very pertinent question. Sometimes you have to stand your ground and be firm in what you consider “right.” Sometimes being right is just not that important. Choosing which applies in each situation is one of the things you have to decide on your own. Observing the results of your choices, right or wrong, is where wisdom is born. Your horse’s interaction with you is a terrific reflection of your choices. Horses are congruent, honest, and in the moment. They’re a terrific mirror of your state of being. 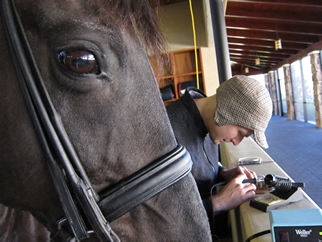 If you take the time to observe, and you’re open to the message, you can learn a lot from your equine friend.